Hi, can anybody help me locating bags of Gypsum. I have tried local garden outlets and some farm supplies shops but to no avail. They tell me they have a mixture of fertilizers with gypsum added, however it is in large farming size bags, 30KGs. I need something to help break down the heavy clay in our garden. Any suggestions. Is there a global house near by. You may find it easier to get dolomite. Of the three limes I find it the best to deal with our clay soil in Sisaket. Hi Yes, we have a global house here. Hi, thanks for that will try to locate some. Dolomite is not always appropriate, it depends on soil Magnesium level. 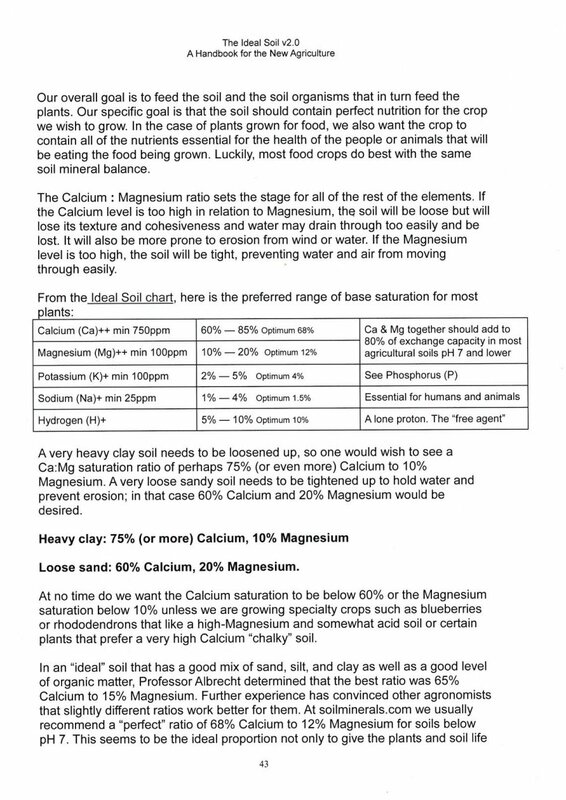 If soil is high Mg to Calium ratio it will be tight and not drain well. Dolomite adds Mg which would worsen the condition. On the other hand if Mg is deficient, dolomite could help. Gypsum is Calcium and Sulfur, a safer bet, but it's still best to avoid the guess-work and invest in a soil test. How does dolomite change the chemistry or characteristics of clay in soil? Thinking back 45 years to my soil mechanics classes, the addition of the various limes (and even cement!) changes the physical and chemical characteristics of clay. Clay forms in hexagonal platelets, which explains why dried out clay soil often has a hexagonal pattern of cracks. Lime causes the platelets to coagulate (maybe I mean floculate), thus making it less water retentive and preventing it from 'gluing itself together. Mind you, it was 45 years ago and I have drunk a few beers since then. to 85% : Mg 10% to 20% will set the stage for managing healthy soil. As far as how dolomite changes soil chemistry and characteristics, this can not be answered out of context of the soil test. 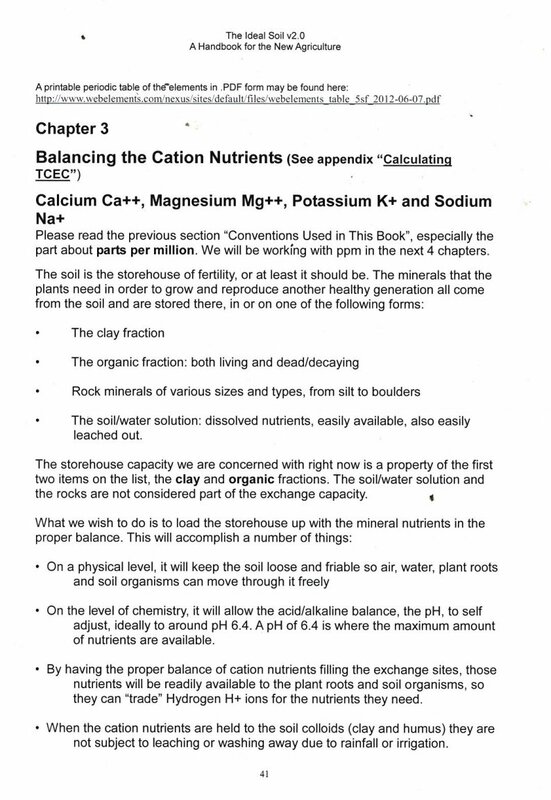 If the soil is deficient in either or both of these minerals, then dolomite will help to supply them. But in what amount needs to be determined by interpreting the soil analysis and with recommendations in relation to other factors. If the Ca and Mg levels are adequate or high, then adding dolomite may shift the balance to an unfavorable condition. In a tight, poorly drained clay soil with high Mg:Ca ratio, you certainly don't want to add more Mg or raise the percent in relation to the Ca. The result would be tighter soil that doesn't drain well. Did you ever find a distributor of Azomite, Dolomite, kelp meal, fish meal, bone meal, blood meal here in Thailand? I am looking for some of the same products in the Nakhon Sawan area. Did you ever find a distributor of Azomite, Dolomite, kelp meal, fish meal, bone meal, blood meal here in Thailand? I am looking for some of the same products in the Nakhon Sawan﻿ area. I know this post is old but the wifes family owns the bonemeal factory in Nakhon Pathom that process most of the bone from the seven provinces west of bangkok. We deliver in 50 kilo bags. We can also provide fishmeal at the moment processed by one of our partners and not by us. Bloodmeal is something that is difficult to get in thailand for the reason that most of the blood from butchering is sold to restaurants that use it in cooking. I was asked by her family to help them widen their productionline 2 years ago and blood meal was one thing that we looked at. We normally have Mycorrhizae aswell as azomite in stock aswell. We can arrange delivery all over thailand with external shipping company but if can deliver with our own trucks if its within 300km from our factory. Delivery by pickuptruck is for 2 ton order. 7ton with 6 wheel truck or 13ton with 10wheel truck. contact information can be found on www.bonemeal.net (i just registered the domain for better exposure) or on facebook. I have mentioned this a few times before but I never got a response from anyone. I have, many times, improved clay soil by adding sand (quarz, or river sand, which has an acidic pH). Most builders' sand is suitable. If you aren't sure of the pH of your sand you can test it with HCl acid; if it fizzes, it isn't acidic sand. I turned a heavy sticky clay that turned into concrete in the dry season and became impossible to walk on in the rainy season into a nice, friable soil with good organic content. You can work it in with a machine but I just threw in a centimetre or two after digging over. It took me a year or two as I didn't want to add too much. I didn't want to say it, because I respect your experience and I don't really have an opinion, I used to think it was a good idea too But in recent years there has been a lot of negative feedback about adding sand to clay soil, especially in small amounts. And it makes sense, how do you make concrete? With mixed size aggregates, right? Sand is often recommended to lighten clay soil. This seems a practical suggestion: after all, clay is the finest-textured soil and sand the coarsest, so mixing the two should result in just the right blend. It’s not that simple, though. The problem is that you must add a great deal of sand to make a difference–at least 4 inches of coarse sand to the top 6 inches of clay soil. Improving even a moderate-size planting bed thus requires a great deal of heavy sand and heavy labor. Many gardeners compromise by simply sprinkling a little sand on top of their clay soil, but such small amounts do no good; in fact, they actually compact the soil further. Mmmm... hate to argue. I add small amounts, year by year until it 's right. FOUR INCHES? You're joking, right? It's easy to transform clay soil using sand and I would say I added per !0 M2 about 1 wheelbarrow (120 litres) full. The aim is not to transform it into sandy soil but to make it workable. If you have to do it again that's no big deal. Important is to use quartz sand, acidic sand, and not the cheaper stuff which clumps together when left in a heap. Obviously using non-acidic sand will transform your soil into concrete. I repeat, I transformed the horrible almost unworkable heavy clay soil that I found into a lovely friable, high organic content, soil. I have been doing this for years in different countries and climate zones. Quartz sand, river sand, acidic sand. Oh, and by the way, the "garden myths busted" site went off my list long ago.